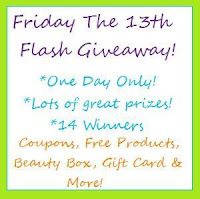 Lucky Friday the 13th Flash Giveaway! 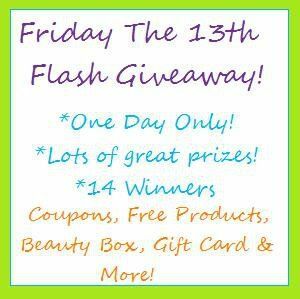 16 People Will Win Coupons, Makeup + Much More! Who says Friday the 13th has to be an unlucky day?! I've teamed up with several other bloggers to help make this day lucky for a bunch of people! 16 people to be exact! This giveaway is only 24 hours long and ends at midnight 1/14, so hurry and get your entries in and GOOD LUCK!